What do eggs and Chenin Blanc have in common? Eggs make Chenin Blanc Pairings that just make us look good. Keeping a few versatile things on hand makes people seem prepared. You may have heard a good hostess always has some ice cream and pound cake in the freezer just in case. Not at the Tasting Pour kitchen, we have eggs for easy elegant Chenin Blanc Pairings. 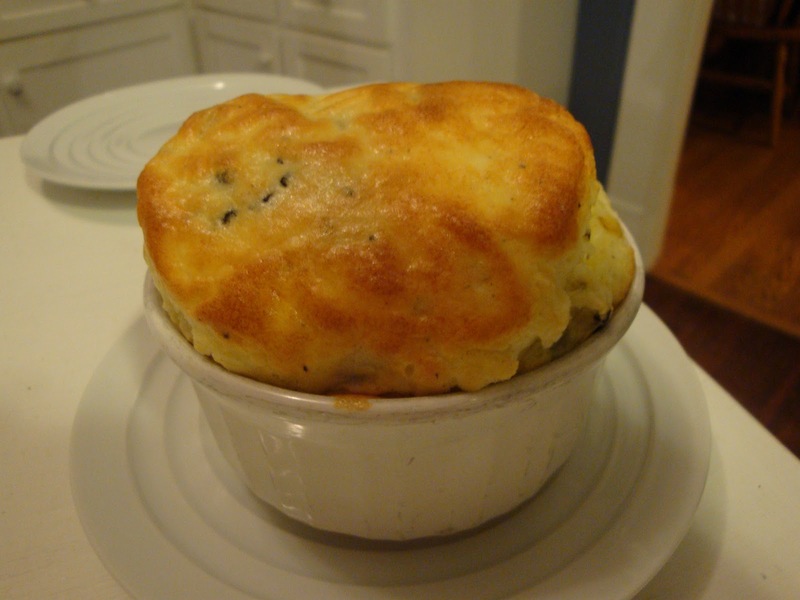 Read on and discover even savory souffle can be easy. There are typically 100 pleats on a toque blanc – the chef’s hat. The pleats supposedly represent the number of ways a trained chef can cook an egg. Keeping eggs on hand, allows us to whip up breakfast, brunch, lunch, or dinner with no advanced planning. Since eggs are instrumental in a number of desserts from ice cream to crème brûlée, they really are the most remarkable single ingredient you can keep on hand. 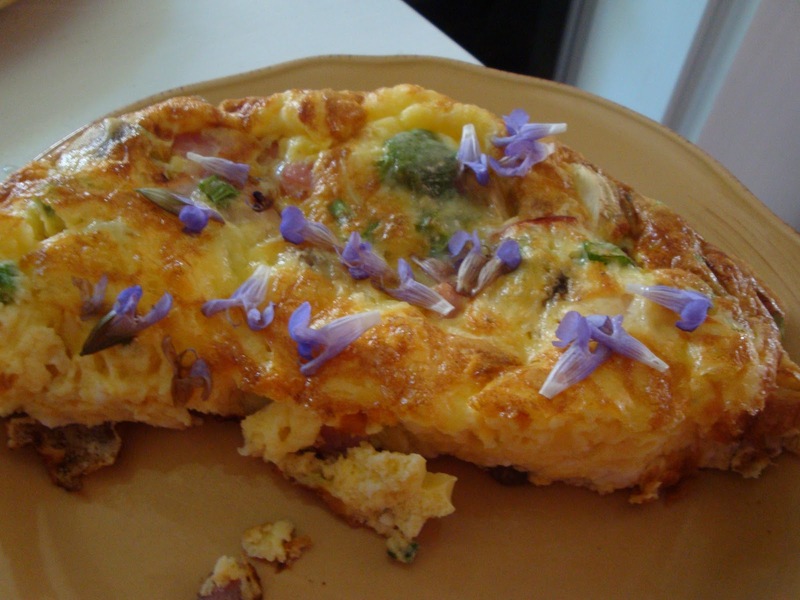 Simply throwing in leftover cheese, veggies, and herbs into an omelet, frittata, or even a scramble can make a great meal with many flavor options. In the winter when greens are lean we like to combine bacon, kale, red onion and blue cheese. Cilantro, black beans, and tomato or salsa give a Mexican twist. Springtime means asparagus, mushroom and prosciutto. Eggs are never boring and can be accompanied by toast and jam, green salad, roasted potatoes, or soup depending on the time of day. Here’s a hint to make your egg dishes even more compelling. Remove from heat and then toss edible flowers on top to infuse flavors. Try sage, arugula, or Thai basil flowers. There is a joke at our house that when there is no plan for dinner, we will have a soufflé. We always have eggs, cheese, and herbs. Beyond that ingredients are improvised and the only reason people think soufflés are difficult is because they look so beautifully fancy. Click here for a step by step guide to create a soufflé. To complete the easy meal masquerading as fancy, you need a versatile wine. This wine should have varied flavors, balanced acid, and a broad audience. We have always been impressed with the many forms of Chenin Blanc – dry, varying levels of sweetness, sparkling. Of course there are other versatile grapes. Riesling comes to mind and while you CAN get sparkling versions, they are not widely available. Chenin Blanc boasts a dazzling array of potential flavors depending on style and development – floral, chamomile, honey, vegetal, wet wool, quince, pineapple, tangerine, peach and apricot, lanolin, lemon, herbs, toast, and menthol. Because Chenin Blanc has high acidity, the best bottles also have the potential to age. It is said to be “simultaneously taut and luscious, austere and voluptuous.” We find it to be both nuanced and accessible – a great wine for simple dishes that taste complex. A sparkling Chenin Blanc might be one of the most versatile wines in your cabinet. Pair it with your soufflé for brunch, lunch or dinner. It is even a great aperitif. Even dry Chenin Blanc is lush enough to seem off dry. Coupled with refreshing acidity, it is easy to pair with food and can be quite a crowd pleaser. 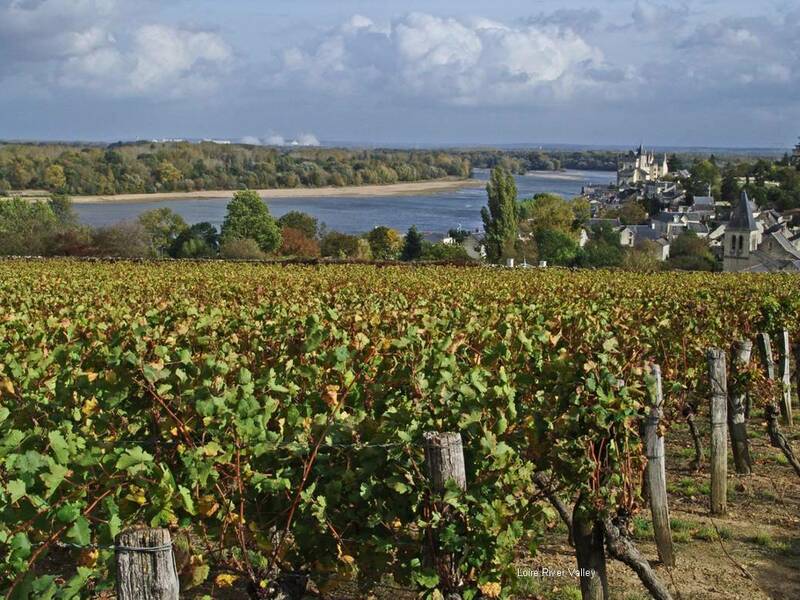 The classic growing region for Chenin Blanc is the “garden of France,” the beautiful Loire Valley. Like many French wines, you are unlikely to see the varietal name “Chenin Blanc” on the label. Reference the chart below for label clues. Chenin Blanc is also produced in dry, sweet, and sparkling styles in South Africa where the grape is called Steen, but more typically labeled Chenin Blanc for export. Give this Chenin Blanc Pairing a try. A table set with a chilled glass of Chenin Blanc and a soufflé says, “It took me a week to plan this meal”. No one has to know that you really walked into your kitchen, hands on hips, and said, “Hmmm, what have I got for dinner?” And if you are worried about your soufflé, serve a glass of that Chenin Blanc as an aperitif. By the time dinner is served, no one will care if the soufflé fell.This post is part of Tasty Traditions. Remove from heat and add chopped herbs. Melt 1 Tbs. butter in small sauce pan. Add milk in steady stream, continuing to whisk. In separate bowl, beat egg whites until foamy and add pinch of cream of tartar. Continue to until whites just hold stiff peaks. Fold ⅓ whites into cheesy mushroom filling to lighten. Fold cheesy mushroom filling into remainder of egg whites. Divide mixture between the two buttered ramekins and set on baking sheet in oven. Cook on middle rack for 20 minutes and serve immediately. You can really play with this recipe. Throw in some bacon. Make it with finely chopped broccoli and cilantro instead of mushrooms and sage. There are no rules. Just make sure the eggs remain the star and the rest is flavoring. Add too many ingredients and the souffle will be heavy and won't rise well. And remember, even if it falls it will still taste good - especially with wine! Awesome Post Jade — and I could not agree with you more. Eggs are "almost always" our go to standby for what to fix for dinner — when "we" haven't planned a menu! Preparing a soufflé on the other hand is something we haven't tried to make ourselves (not having sufficient patience mostly)…but when Trader Joe's used to have them as one of their frozen food options — we would quite often have a TJ's cheese soufflé. Now all that said — the Chenin Blanc never entered our mind…but just you wait!! BTW — tried to copy and/or print your soufflé recipe…but could never get but half of the recipe to copy or pring…even when I right-clicked and hit "Select All." Any suggestions? Yes a soufflé is definitely more involved than a scramble and the scramble can be just as good. We first started making soufflé after a visit to a San Francisco restaurant called Café Jacqueline. Except for some soup appetizers and the best bread I have ever tasted, the entire menu is made up of soufflé. You choose a savory soufflé and a dessert soufflé and they come fluffy and steaming to the table. When you pass by the kitchen you can see Jacqueline beating away at egg whites. White haired and “grandmotherly” in appearance, Jacqueline’s soufflé taste like she has done nothing but beat egg whites every day for many years. Her husband was reading the paper in the cozy dining room. You can see why I had to try soufflé at home. I would not fault ANYONE for omelets and Chenin Blanc for dinner and would be a happy and appreciative guest for such a meal. The recipe is saved as a picture file. I do not know why it is misbehaving. I will email it to you. Thanks for the comment.